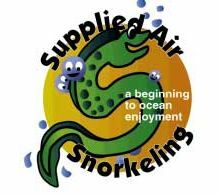 Supplied Air Snorkeling for Youth, or SASY is the latest innovation in scuba equipment for young children. Ages 6 & up can now use a scuba unit which combines a regulator and a buoyancy compensator to breathe from a continuous air supply while floating safely on the surface. Where normal snorkels can leak and frustrate young children, the SASY unit lets them breathe continually while keeping their faces in the water. This allows them to watch and interact with divers below. SASY uses either a 13- or 19- cubic foot tank, which fits into a special holder. Two small straps on either side keep the tank from rolling. The unit's regulator hose runs from the tank under the arm and is attached so the mouthpiece stays in front of the child. The mouthpiece attachment is also designed to prevent kids from removing the vest and breathing below the surface. The vest, which incorporates 3/4-inch foam, provides 7 to 8 pounds of buoyancy. It has two adjustments: one is at the shoulders, and the other is a crotch strap. The strap keeps the unit in place and allows the child full use of the internal buoyancy. The buoyancy is situated so that the child can be upright in the water when he or she is not kicking. SASY not only allows youngsters to enjoy scuba diving but also introduces them to the marine environment. Kids can now join their diving parents on an ocean scuba adventure! Includes a short equipment briefing and skills assessment. Then a tour off the beach if conditions allow, otherwise in the pool. Total time approx. 30-40 minutes. This is a repeat SASY as the pool experience is a prerequisite to the open water experience. Includes a briefing and supervision on the afternoon dive boat. Must be accompanied by a parent or legal guardian. Includes a short equipment briefing and skills assessment under direct supervision. Then supervised with other snorkelers. No pool skills are required prior to this trip. 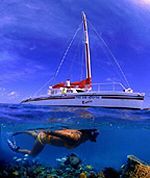 Choose between the Half Day Luncheon Snorkel Sail or the Antilla Sail.